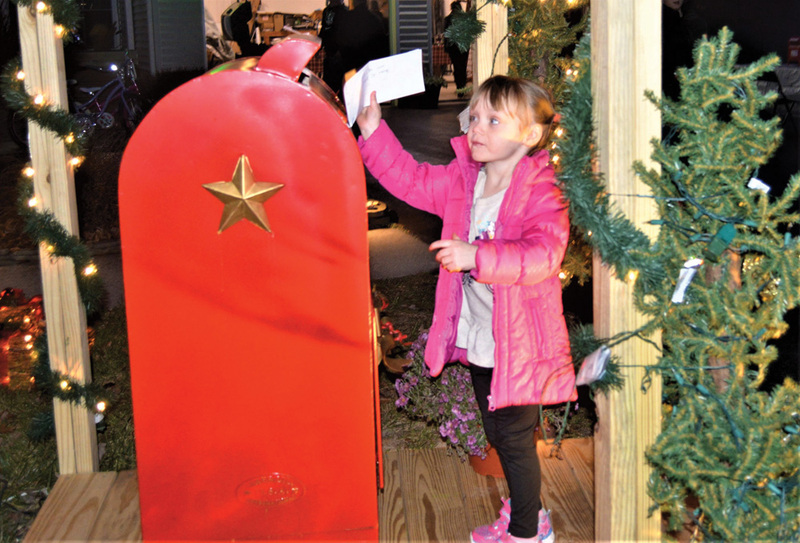 Belle DeMarie, 3, of Ocean View places her letter in the special mailbox at the Santa's Letters Neighborhood Holiday Gathering in Dagsboro on Wednesday, Dec. 12. Inspired by a shiny red mailbox, a Dagsboro couple who were feeling a bit down at the approach of the holidays shook off their melancholy, put forth their idea and waited for the community to respond. Thanks to the immediacy of social media, it was only a few hours before Kristina and Sean Malone had their first letters. That first handful of letters became a dozen, a dozen became 100, and by the beginning of this week, they had responded to 250 letters from children — and, as it turns out, some parents as well. It was those letters from family members that started another part of the Malones’ new Christmas mission — to help families in need who asked for help shouldering burdens that tend to feel a bit heavier at this time of year. “We have gotten nine letters or emails from families asking Santa for help with Christmas gifts for their children,” Kristina Malone said. “Most moms who wrote us are hard-working, just having a rough time,” she said. The Malones have helped Santa help a Milford mother of four and a family in Georgetown with one young daughter and another child on the way, as well as “several single moms who just can’t seem to provide a nice Christmas for their families,” she said. Most of the mothers who reached out, Malone said, have between two and four children, ranging in age from 2 to 16. Other community organizations have jumped in to help, she said. For example, Daisey and Dylan Ewing have provided help with a family of six in Frankford, with the support of Hightide Church. A family of five in Selbyville will be having a more wonderful holiday with the help of the G.W. Carver Parent Education Center in Frankford and Vogue on 54. “Once we receive word that a family is in need, we post it on Facebook and we get people that offer to help, right away,” Malone said. “We try to offer families at least two gifts and an overflowing stocking per child,” she said. “Stockings are a big deal to me; my mom always made those so special,” she added. In fact, Malone said, the couple expects to have stockings left over after all their requests have been filled; those will be given to the food bank at the G.W. Carver Parent Education Center. In addition to writing for Santa more than 200 letters to area children, the Malones hosted a neighborhood gathering on Wednesday, Dec. 6, that drew about 100 people to their Dagsboro home. The event, held in their yard, featured a visit from Santa and Mrs. Claus, hotdogs grilled in the driveway by Sean Malone, a bonfire, hot chocolate and, of course, an opportunity to write a letter to Santa and drop it in the big red mailbox. A “Selfies with Santa” event was held the following evening, at the Billy Reese State Farm Insurance office in Selbyville. Going forward, the Malones said they hope to fine-tune their efforts to help their community. They’ve already completed the process of becoming an incorporated non-profit organization and plan to build on that to “market” their efforts to area organizations with which they would like to partner, Kristina Malone said. The Malones have already spoken with members of the Good Ol’ Boys Foundation, a local group that helps with various community needs and just this week helped organize an inaugural Christmas parade in Gumboro. For more information on Santa’s Letters’ activities or to learn how to donate or help the organization, go to www.santaslettersinc.com.